"The ability to redefine femininity through hard work and high goals in strong women is art and deserves to be shown to the world." 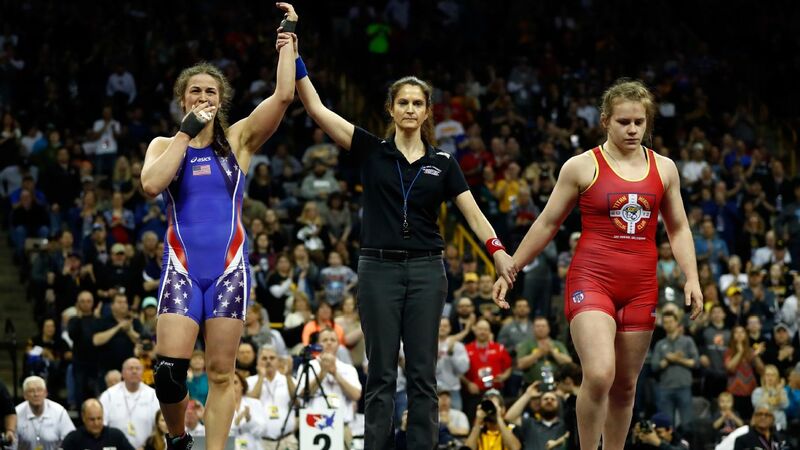 Adeline Gray might be making her Olympics debut in August, but she's far from a rookie: Gray has competed in every world championship since 2011, taking home three gold medals in two different weight classes. Before heading to Rio, she sat down with the Body Issue's Morty Ain to talk about wrestling at her natural weight and the message she wants to send to young fans. Women's wrestling is a great sport that a lot of people don't know about. I still get that sideways tilt of the head, like a puppy is looking at me: "Women wrestle?" It's almost disheartening, because I work very hard and it's a very competitive field internationally, and people in our country just don't really know about it. I'm a three-time champion and should, in my eyes, be kind of all over the place. But there are still people who are like, "I didn't even know you guys were in the Olympics." "Yep, we are. It's been a few cycles now." I absolutely hate the statement "You're too pretty to wrestle." I think people used to view female athletes as very butch, masculine -- you kind of had to disregard your femininity to excel at an elite sport. Now it's just a different world. With heavyweight wrestling, people are expecting this Helga type of woman, obese and going out there on the mat to try to smash people's heads. It's so much more than that -- the weight is really low, so it's about technique. It's skill, strength, power and executing that in a very precise way. When I talk to young girls, I tell them you can have the best of both worlds. You are allowed to be a female and be considered beautiful and still be an athlete and still be badass in that realm. I would hear, years later, "Yeah, that guy was afraid of you in high school." Why? I'm nice! I just don't understand where that came from. It's like saying a boxer just goes around hitting people all the time. I've never been in a fight, I've never hit anybody. I never challenged anyone at a party. So I don't know why that fear exists: "Oh, she can beat me up if she wanted to!" Yeah, but ... I don't really fight people. I really don't even consider myself so much of a fighter when I get onto the mat. I'm more of a calm person who goes out there and has better technique and better strength and skill than somebody -- there's a lot more strategy that goes into it than people realize. There's what I'd call calculated aggression, but yeah, my immediate reaction if I get too upset or too frustrated with something is to cry. And it's not really a good thing to be crying on the wrestling mat. I get the question about MMA a lot. My mom says she likes my nose, so she doesn't really want me to fight! But if the price is right, I can see it happening. I just don't know ... I don't have a killer instinct. I'm more like, "Oh no! Are you OK? Oh, wait, I have to win, OK, keep going." I think my bond with my father has been what's really made me so successful. My father was the youngest of seven boys. So when he had four daughters, I think it was kind of a shocking moment: "What do I do with girls?" When I started wrestling, it built this really amazing relationship with my dad. He was my personal coach for the first eight years of my life, and he's been to every one of my world championships, hugging me at the end of each one. I have large lats, so any dress that zips up is definitely a struggle. I was maid of honor for my best friend's wedding, and I had to go up about four dress sizes just so I could get it to zip. Then my weightlifting coach kindly put me on a new, very intensive program for upper-back strength, and I gained half an inch on each side of my back. I had to really hold my breath throughout the night, and at the end of the night I busted the dress dancing. The whole side of the dress was just shredded. I won't have to fake like I was ever going to be wearing that dress again! There's definitely something to be said about wrestling at your natural weight. I'm now wrestling a lot closer to my natural weight class, and I'm getting to focus more on wrestling and just getting better and making my body stronger, rather than constantly fighting to make my body small enough. Everyone is so focused on losing weight -- your body likes to fit within a certain range, and if you force it to go one way or the other, it's difficult. I had to cut almost 30 pounds for the 2012 Olympic team trials. Before the matches, I was eating dinner with my mom and I just stopped and was holding my jaw. She was like, "Oh, did you get hit in one of your matches?" "No, my jaw is sore from not chewing food for the last three weeks before this event." I was just eating protein shakes for every meal. The realization that I hadn't chewed and used those muscles in so long that they would cramp up and get sore halfway through a meal ... it was almost heartbreaking, because why would somebody do that to their body? I can be so stubborn when it comes to rehab. I dislocated my knee in 2010 at a World Cup event, and over the course of rehab, I didn't realize that I was basically dislocating it every day. One day I was driving back to Denver to see my family, and when I went to press on the gas pedal, my kneecap popped out. I had to hold it in place the whole way to Denver -- just cursing my sport and my whole situation the entire time. You are allowed to be a female and be considered beautiful and still be an athlete and still be badass in that realm. It's amazing how limited I still am on that side. Eventually, I had surgery, but I had to accept that my leg was never going to be the same leg it was. And I think every athlete goes through that moment when they realize that the arm they broke is never going to be 100 percent but that they can still win with it. I think that's what has made me such a great athlete -- I don't have to be 100 percent, I just have to be good enough to win. Finding that new normal just takes some time and some coping. I don't have cauliflower ear. My dad was adamant that I wear my headgear growing up. That's because I was born with a dysfunctional eustachian tube, which connects your throat to your ear canal. Most people have a certain degree of tilt, but mine doesn't have enough tilt to drain properly. I've had 15 ear surgeries, and I'm partially deaf on my left side just because I have so much scar tissue buildup. I want to impart some dreams to young girls who haven't had opportunities in the past. Boys really have a leg up on us because they have these professional leagues that they can dream about. So if I can be like Serena Williams or like some of these main stars out there who are being iconic and groundbreaking and are role models for this next generation, it would be an honor and a blessing.